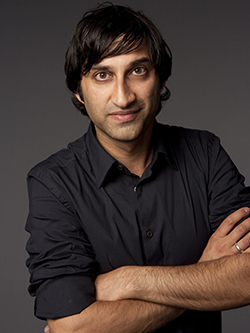 The National Film and Television School (NFTS) Board of Governors has bestowed an Honorary Fellowship on Academy Award and four-time BAFTA award-winning director, writer and producer Asif Kapadia. NFTS Director Jon Wardle presented the Fellowship, which is awarded to individuals who have made an outstanding contribution to the industry, at the School’s annual graduation ceremony which took place on Wednesday February 28th, 2018. Asif Kapadia won a ‘Feature Documentary’ Oscar for Amy, which documents the life and death of British songwriter, Amy Winehouse. His documentary, Senna about Brazilian motor-racing legend Ayrton Senna, was a huge international box office hit and won multiple awards including two BAFTAs. Kapadia’s career began at film school where he made award winning short films including his student film, The Sheep Thief, which won a prize at the Cannes Film Festival. Kapadia followed this by writing and directing his debut feature The Warrior, an epic western shot in India, winning two BAFTAs for ‘Outstanding British Film’ and ‘Best Debut Feature’. He directed two episodes of David Fincher’s critically acclaimed Mindhunter crime drama TV Series and is currently in post with a documentary about footballing legend, Diego Maradona. Former NFTS Director, and producer of Oscar and BAFTA award-winning films, Nik Powell OBE was also honoured at the event.